Phillies Fans Have Something To Smile About — Free Booze! Champagne's not just for winners anymore. 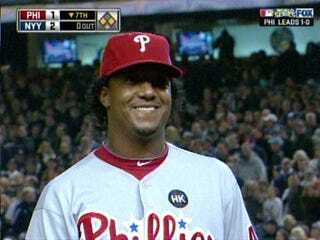 Maybe that's why Pedro left the game with a poop-eating grin. Hotel Indigo NYC Chelsea, the boutique chain's newly opened first New York City location is celebrating the Yankees entry into the World Series with a special deal for Philadelphians! In anticipation of your misery, the hotel is ready to cheer you up with its "Drown Your Sorrows" champagne promotion. Here's how it works: Book a room for the night of any World Series 2009 game with the Phillies playing at Yankee Stadium. If – as expected – the Phillies lose, then present your ticket stub at the front desk showing your attendance at the game, along with a valid drivers license proving your address in the city of Philadelphia (and that you are 21 or over!). You will then receive a complimentary bottle of Perrier-Jouet champagne to help ease your pain. Eat it, Daulerio. Or should I say, drink it?